The Handy Hold All from Sarah Shaw comes in several fun, colorful prints and has totally organized my handbag collection while making my eeny-beeny closet look way cute. They are so affordable, I bought 3 in different patterns just to mix things up. With seven loops each, I love how I can now actually see all my handbags in a tiny space! I'm even buying several to keep the actress' handbags organized on my wardrobe truck. That's how much I love them. With my busy work schedule I've been thinking a lot about comfortable clothes lately. I wish I could wear my PJ's to work! I know many busy women insist on comfort over style. They wear ratty t-shirts, baggy sweats, sloppy jeans...you know the look...a walking pile of laundry. Because they are made from organic materials they breath, making them cool and soft. The stretchy-ness adds to the comfort while maintaining a trim, pulled together look. Add a few of these options to the grab-and-go section of your closet with some colorful accessories and never look in need of a fluff-and-fold again! Jewelry and accessories are a vital and therefor important part of what you are communicating to people via your image. Today I had a fitting with our lead actress and finally had to choose between these two beautiful necklaces from Marie Todd. The character, "Beth" is a young lawyer who "doesn't know how beautiful she is". Our lovely actress is very fair skinned, has almost white blonde hair, china blue eyes, and a splattering of pale freckles across her nose. I chose a delicate palette to match her delicate looks and vulnerable character description. Either necklace could work. So which necklace did I select? The second one. 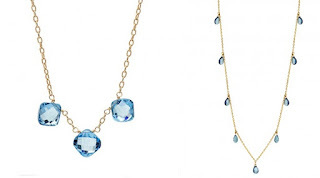 I felt the first necklace with it's larger stones, while delicate and simple, made too much of a statement. The second necklace still has the blue stones to play up her blue eyes but looks less thought out. I don't want the viewer to even really "see" it, so to speak. But it finishes off her look in a feminine and professional way. If the character of "Beth", was more self possessed I would have selected the first necklace. When putting your professional look together, think about it. Unless you are a jewelry designer wearing your own designs (and even then, less is more), don't let your jewelry steal your thunder! You want people to focus on YOU, not your jewelry. Use this expensive (and it should be the very best you can afford), accessory to enhance you, not make it's own statement and steal the show as a result. A good manicure is worth a lot more (and costs less), than multiple chunky rings when it comes to selling yourself! 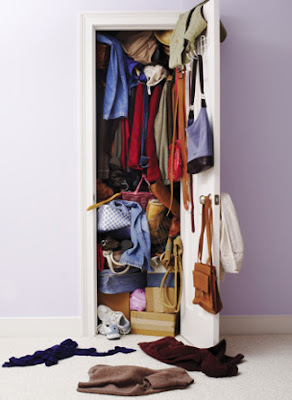 Does your closet resemble this? When I'm working on a movie I have a plan for each character. First I develop the "look", next I assemble the various costume changes, and finally I establish a well organized "closet" for each character that I can turn to with confidence when the inevitable changes in production crop up. As a business person you need that type of closet as well! You need to devote a section of your wardrobe just to the character of "YOU, the business owner", that you can confidently pull from when you most need it. In future posts I'll go into detail about how to achieve this but for now, take a good look at your closet and assess where you need help. I'd love to see the inside of your "before" closet so just shoot me a photo of it and you will be amazed by your "after photo" once we've cracked it with some fun tips from the pros! In my film career I've re-invented several classics and brought the brands to a new generation. 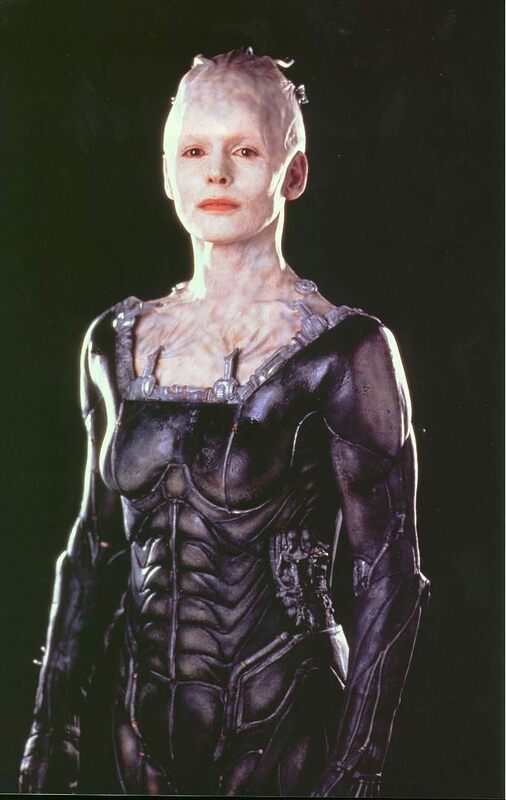 For Star Trek is was about taking the crew out of stretch pants and taking an evil species to a new level. 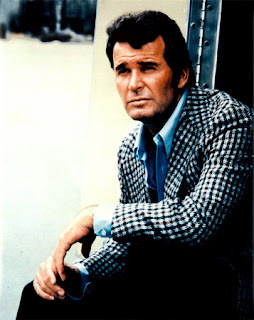 My next adventure is stepping out of the sci-fi world and bringing a true TV classic, The Rockford Files, into the 21st century. I'm so excited! If you want to see how I pull this one out of a time warp and re-brand it for today... sign up at the mailing list button to the right for private behind-the-scenes info delivered weekly. You don't want to miss this...we're gonna have fun! In the meantime, ask yourself if you are stuck in a time warp. How can you re-invent yourself and your brand? 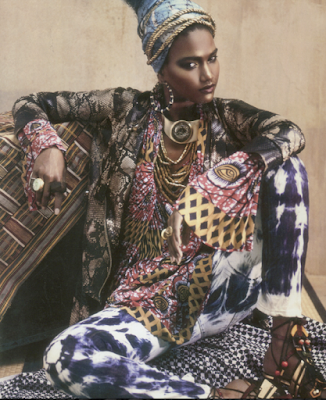 I''ve seen rational, intelligent women loose their mind when it comes to prints. Some are paralyzed by the very idea and refuse to don anything with a print or even a pattern. Solids only! The other group love happy prints and attack print mixing like an whirling dervish. Result; clown clothes. There is no need to fall into either group. Prints are your friend! They jazz up an otherwise boring outfit adding flare, wit, and imagination. While extreme print mixing as shown on the model above should be left to those with a keen eye and a boatload of confidence, a little dash of print or pattern can do more to add interest to you and your outfit than almost anything else in your wardrobe!